MINSK, Belarus -- Ukrainian President Petro Poroshenko says a "roadmap" will be prepared to end fighting between troops and pro-Russian separatists in the east. 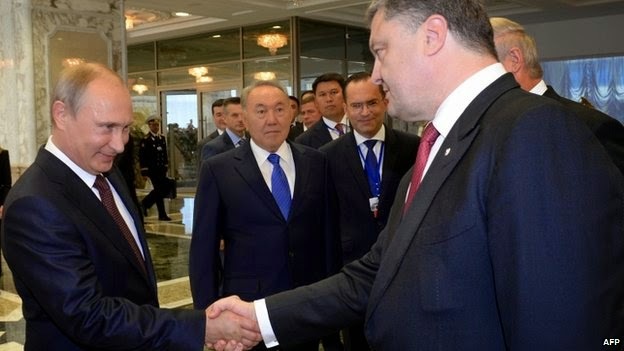 Vladimir Putin, left, and Petro Poroshenko shook hands at the start of the summit. He was speaking after holding his first direct talks on the crisis with Russian President Vladimir Putin in Belarus. Putin said Russia would assist a dialogue, but stopping the fighting was a matter for Ukraine itself. Ukraine and the West accuse Russia of arming the rebels, a claim repeatedly denied by the Kremlin. "A roadmap will be prepared in order to achieve, as soon as possible, a ceasefire regime which absolutely must be bilateral in character," Mr Poroshenko said after two hours of talks with Putin in the Belarusian capital, Minsk. Earlier this year, Mr Poroshenko declared a unilateral ceasefire but accused the rebels of not following suit. Prior to their one-to-one meeting, the two leaders also took part in discussions with the EU's top diplomat Catherine Ashton. The summit came after 10 Russian soldiers were seized in Ukraine's east. More than 2,000 people have died in fighting between Ukrainian forces and separatists in Donetsk and Luhansk. The two regions declared independence from Kiev following Russia's annexation of the southern Crimean peninsula from Ukraine in March. In a statement on his website after the talks, Mr Poroshenko added: "Our main goal is peace. We are demanding decisive actions which will bring peace on Ukrainian soil." "The logic of a peace plan was after all supported by all the heads of state without exception." Meanwhile, Putin said at a news conference that "Russia, for its part, will do everything to support this peace process if it starts". But he stressed that it was up to the government in Kiev and separatist leaders in the east to work out conditions for a truce. The two leaders reportedly agreed to hold further consultations between Ukraine's and Russia's border guard agencies. Before the face-to-face meeting there were doubts that such talks would even go ahead, the BBC's Duncan Crawford in Minsk reports. The pair last met briefly in June at the D-Day commemorations. Mr Poroshenko has repeatedly insisted that the only way to end the bloodshed and stabilise the region is by establishing effective border controls. The meeting came as part of a summit taking place under the auspices of the Moscow-led Eurasian Customs Union, which also includes Belarus and Kazakhstan. Baroness Ashton described the multilateral discussions held earlier on Tuesday as "positive". "There was a sense in which the onus was on everyone to see if they could do their best to try to resolve this," she said. "We called for a ceasefire linked to the proper management of borders, the importance of ensuring that humanitarian support reached people in the proper manner in full line with international law, and of course the political process". The EU, along with the US, has imposed sanctions on Russia for failing to rein in the separatists. Earlier, Ukraine said its military had captured 10 Russian paratroopers near the village of Dzerkalne, near the Russian border. A Russian defence ministry source told the Russian news agency RIA Novosti the soldiers crossed the border "by accident". The source also said some 500 Ukrainian servicemen had crossed the border at various times, adding: "We did not give much publicity to that. We just returned all those willing to return to Ukrainian territory at safe places." But Ukrainian military spokesman Andriy Lysenko said: "This wasn't a mistake, but a special mission they were carrying out." "Stop sending in our boys. Why? This is not our war. And if we weren't here, none of this would have happened." Russia has repeatedly denied Ukrainian and Western accusations that it is supporting the rebels. On Monday, Ukraine said an armoured column had crossed the border into south-eastern Ukraine, sparking clashes near Novoazovsk. Mr Lysenko said on Tuesday that Ukrainian forces had destroyed 12 armoured infantry carriers there. He said 12 Ukrainian military personnel had been killed in the past 24 hours. He added that four border guards had been killed by fire from Russian Mi-24 helicopters.